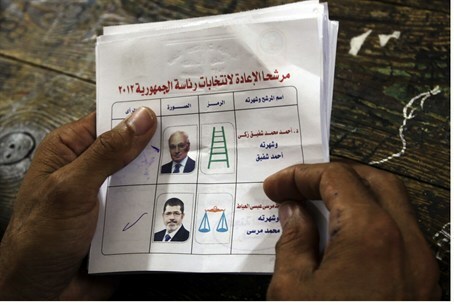 Egypt's Muslim Brotherhood claims its candidate, Mohammed Morsi, won the presidential runoff with 51.8% of the votes. The Muslim Brotherhood declared early Monday that its candidate, Mohammed Morsi, won Egypt's presidential election. The Associated Press reported that at a pre-dawn press conference declaring their win, officials from the fundamentalist group, banned for decades and repeatedly subjected to crackdowns under former President Hosni Mubarak's rule, were ebullient and smiling. Final official results are not expected until Thursday, AP noted. The Brotherhood's declaration was based on results announced by election officials at individual counting centers, where each campaign has representatives who compile the numbers and make them public before the formal announcement. The Brotherhood's early, partial counts proved generally accurate in last month's first round vote. The group said Morsi took 51.8 percent of the vote to rival former Prime Minister Ahmed Shafiq's 48.1 percent out of 24.6 million votes cast, with 98 percent of the more than 13,000 poll centers counted. Earlier on Sunday night, just two hours after polls closed, the Brotherhood claimed that Morsi was leading in several provinces, the Al-Arabiya network reported. Morsi campaign official Yasser Ali told a news conference that Morsi had 61 percent of the 1.4 million votes counted so far, compared to 39 percent for Shafiq. Al-Arabiya reported that a Shafiq campaign official dismissed the Brotherhood's count, saying his candidate was ahead, but gave no numbers. Voter turnout on Saturday, the first day of the second round of the presidential elections, was low compared to the first day of the first round. Meanwhile on Sunday, Egypt’s ruling military issued an interim constitution defining the new president's authorities, The Associated Press reported. With parliament dissolved and martial law effectively in force, the generals granted themselves considerable authority and the main role in charting the country's future.. According to a copy of the new constitution document obtained by AP, the generals would be the nation's de facto legislators and control the budget. They also will name the 100-member panel tasked with drafting a new constitution, thus ensuring the new charter would guarantee them a say in key policies like defense and national security as well as shield their vast economic empire from civilian scrutiny.